When my dear hubby Richard built my scriptorium (the cottage where I write) he put in lots and lots of bookshelves…..that was, well, I don’t want to say HOW many years ago but a long time !! The shelves are now overflowing and its time to downsize my collection. Most of the books are new or like new. Many have never been opened. Some are current titles and others are vintage and out of print. 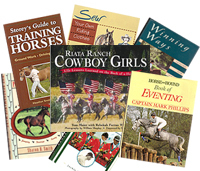 I’ll be adding a handful every week or so, so keep an eye on Used Horse Books. Likewise, Richard is also going through his video and DVD collection. We hope you find something you need or have been looking for.